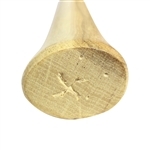 Replacement Premium USA made straight grain hickory handle for your cold steel tomahawk. This handle has been sanded smooth and finished with a nice soft wax. At 22 inches in length it is best suited for cold steel tomahawks only. We cannot guarantee that this handle will fit any other brand of tomahawk head. Hand Forged Small 16" mouse throwing tomahawk ideal for women, children, and young adults. Perfectly Balanced 19" custom throwing tomahawk ideal for young adults & adults alike for backyard fun. Hand Forged 19" Competition throwing tomahawk ideal for Boy Scouts, Mountain Man rendezvous, and backyard fun. Hand Forged Iron 19" large throwing tomahawk heads only ideal for Boy Scouts, Mountain Man rendezvous, and backyard fun. Hand Forged camp & throwing tomahawk ideal for backpacking, hiking, & all around camp use.